SAN MATEO, Calif.--(BUSINESS WIRE)--Today, PokitDok announced it attracted $34 million in funding, led by Lemhi Ventures. This series B round of expansion capital will give healthcare businesses greater access to PokitDok’s suite of Application Programming Interfaces (APIs), services and solutions. This includes solutions for payment processing, eligibility checks, referrals, claims submissions, online scheduling, patient identity management and provider search. The capital will fuel business development, marketing and technical support to meet growing demand from large group providers, healthcare systems integrators as well as telehealth and other emerging digital health businesses. “Lemhi was purpose-built to find and fund disruptive healthcare service companies like PokitDok,” said Tony Miller, founder and managing partner, Lemhi. “In a short window of opportunity to innovate, PokitDok has introduced a novel solution to legacy issues and high costs that plague the healthcare industry. It is the first company to effectively reorganize the underlying technology infrastructure and has a brilliant team to transform the industry forever.” With this round of funding, Mr. Miller, a former healthcare entrepreneur with prior experience at UnitedHealth Group and Deloitte, and Jodi Hubler, Lemhi’s managing director, will join PokitDok’s board of directors. PokitDok raised a series A round of equity funding in June 2013, co-led by New Atlantic Ventures (NAV.VC) and Rogers Venture Partners, and joined by Subtraction Capital and angels Zac Zeitlin and Jonathan Sposato, among others. Since that time, PokitDok introduced an entirely new platform accessible via APIs to streamline the business of health and make common business transactions universally available. These APIs – sets of protocols and tools to build software applications – create interoperability and inspire information access previously considered impossible. For example, to keep pace with the more than 300 million US residents who, by law, are now required to have health insurance coverage, PokitDok created an API-based method for eligibility checks, referrals and claims submissions that can be processed in minutes if not milliseconds. Relationships established in the last 24 months with more than 300 insurers have been instrumental to this digital breakthrough. With more than one billion claims filed annually, Harvard Consulting Group reports an API model has the potential to save the healthcare industry over $320 billion in eligibility, claims, referrals and scheduling alone. APIs allow developers to programmatically unlock data, promote interoperability, reduce human error and dramatically cut unnecessary administrative costs by connecting disparate technology systems with a modern transactional model. PokitDok serves enterprise customers that want to replace or extend legacy infrastructure or use the API model to establish a new market position without interrupting their business. To learn more go to PokitDok.com. PokitDok provides cloud-based web services to integrate healthcare transactions into any app, website or product. This includes eligibility checks, claims submissions, scheduling, payment processing, interoperability and medical procedural code reconciliation. 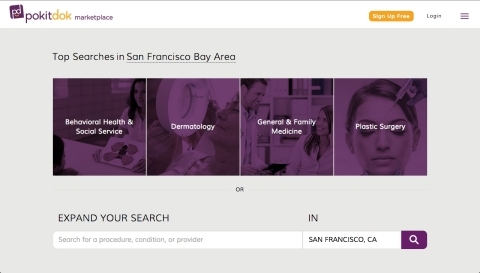 PokitDok makes current cash and insurance prices available for health services from over 40,000 providers in 44 US markets through its API and marketplace. Large group providers, healthcare systems integrators, telehealth businesses use PokitDok to scale quickly, create better consumer experiences, streamline operations and cut costs. PokitDok is based in San Mateo, CA and Charleston, SC and is backed by Lemhi Ventures, Rogers Venture Partners, New Atlantic Ventures (NAV.VC) and Subtraction Capital. PokitDok announced it attracted $34 million in funding, led by Lemhi Ventures. This series B round of expansion capital will give healthcare businesses greater access to PokitDok’s suite of APIs.